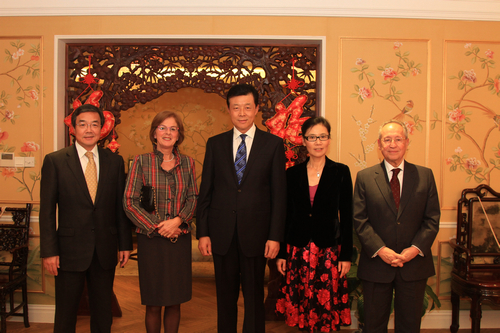 On December 21, Ambassador Liu Xiaoming and Madame Hu Pinghua met at their residence the couple of Mr. E.E. Mitropoulos, the current Secretary General of the International Maritime Organisation (IMO) and Mr. Koji Sekimizu, the IMO Secretary-General in waiting. Ambassador Liu spoke highly of IMO’s long commitment to the maintenance of the maritime shipping safety, maritime security and prevention of marine pollution. He commended the efficient work of the IMO Secretariat under the leadership of Mr. Mitropoulos and thanked him for his active efforts in enhancing the cooperation of IMO with China. Ambassador Liu congratulated Mr. Koji Sekimizu again on his election as IMO Secretary-General and hoped that he would continue to strengthen IMO’s good cooperation with China. The Ambassador said that China as the largest developing country and a big maritime country, has always attached importance to strengthening the cooperation with IMO. The country will continue to support IMO's work and fulfill its due obligations, so as to make its contributions to the achievement of the IMO work objectives. 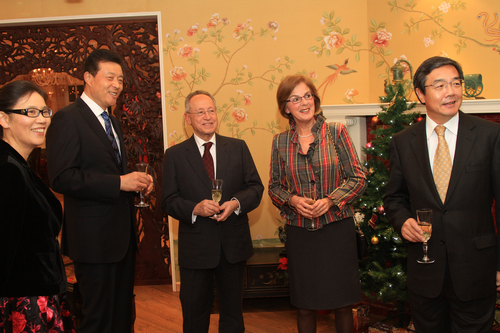 Mr. Mitropoulos thanked Ambassador Liu for the hospitality at his departure, and recalled with pleasure the sound cooperation of IMO and himself with China over the years. He said that the Chinese government attaches great importance to its cooperation with IMO and has been actively supporting the technological cooperation activities of the organisation; China as a big country in shipping, shipbuilding, crew and ship-breaking is playing an increasingly important role in IMO’s various works with a more comprehensively and deep involvement in recent years and is making great contributions to IMO’s work and the development of international shipping. For this he expressed sincere gratitude. Mr. Mitropoulos said that he had visited China for many times and was deeply impressed by the drastic changes in the country. He hoped China would develop faster and better in the future. Mr. Koji Sekimizu thanked Ambassador Liu for the congratulations on his election. He said that he pays great attention to the cooperation between IMO and China in the field of international shipping and expects to build even closer IMO-China cooperative relations after taking his office as IMO Secretary General. He would also be personally committed to the consolidation, cooperation, stability and development of the international shipping community. IMO was founded in 1959. It is the United Nations’ specialized agency for maritime safety, security and the prevention of marine pollution based in London. The organisation currently has 170 members and three associate members. Its technical standards have been widely accepted by the international shipping community. The daily work of the organisation is carried out by the Secretariat under the leadership of the Secretary General, which has 350 international employees. China has been elected as Category A Member of IMO Council for the twelfth consecutive time.